It’s Labour Weekend in New Zealand, the first long weekend in spring, yay! It’s the weekend where people either relax at home maybe preparing the garden for planting, doing outdoor chores and all those jobs that have been put aside over the winter. Or the more adventurous throw caution to the wind and leave the city, hopeful that the long weekend grid-lock just won’t happen this year! I wish them the best of luck and hope they have a stress free drive. Being the homebody I am, after posting this recipe, I’m off to hit the garden and clean out my chicken coop. So given that the meat part of this dish is chicken, perhaps it should be whispered about outside so my girls can’t hear and have yet another excuse to not produce any eggs today. Unproductive chickens, yes that is a story for another day. So onto the food! I love the crunch and colour of stir fried veggies and this dish has plenty. It’s straightforward to make, so don’t let the long list below scare you off, as you will have everything prepared to cook before you even start. And it’s a great dish to make in tandem with a partner who is a whizz at chopping veggies! Don’t limit yourself to the vegetables I have suggested, add your own favourites. Just make sure that if they take a while to cook they go in first. Then the only thing to watch is to not overcook your yummy vegetables and lose the crunch or under cook the chicken pieces. So get marinading today and you have tomorrows dinner sorted. Have a lovely long weekend all you kiwis! • Whisk the vinegar, oil and lemon juice together in a glass or plastic jug until oil is incorporated with the other liquids. • Mix the rest of the marinade ingredients in well. • Place chicken in a leak proof ziplock plastic bag or plastic container – whatever is handy. • Pour over marinade and mix well so the chicken is well covered with marinade. • Place in the fridge on a plate or if you are using a container cover and leave for at least 2 – 4 hours preferably overnight. • While the oven is heating prepare the vegetables so they are all ready to stir fry. • When veges are prepared get the chicken ready to bake. • With tongs remove chicken from the marinade, leaving only a coating of marinade and reserving 2 tbsps of the leftover marinade. • Place chicken on a roasting tray lined with cooking/parchment paper. • Bake for 20 minutes then baste the chicken with the marinade and juices from the bottom of the pan. • While the chicken is baking start your stir fry. • In a wok heat oil and butter on a medium heat. • Add onion and stir fry gently until softened. • Add the chilli flakes and stir in well. • Add broccoli and cook for 5 minutes. • At this point check your chicken for doneness it will cooked when it is white (not clear or pink) all the way through. You may need to cook for a further 5 minutes depending on the size of your chicken chunks. • If your chicken is cooked then remove chicken from the oven and cover with foil to keep warm while you finish the vegetable dish. 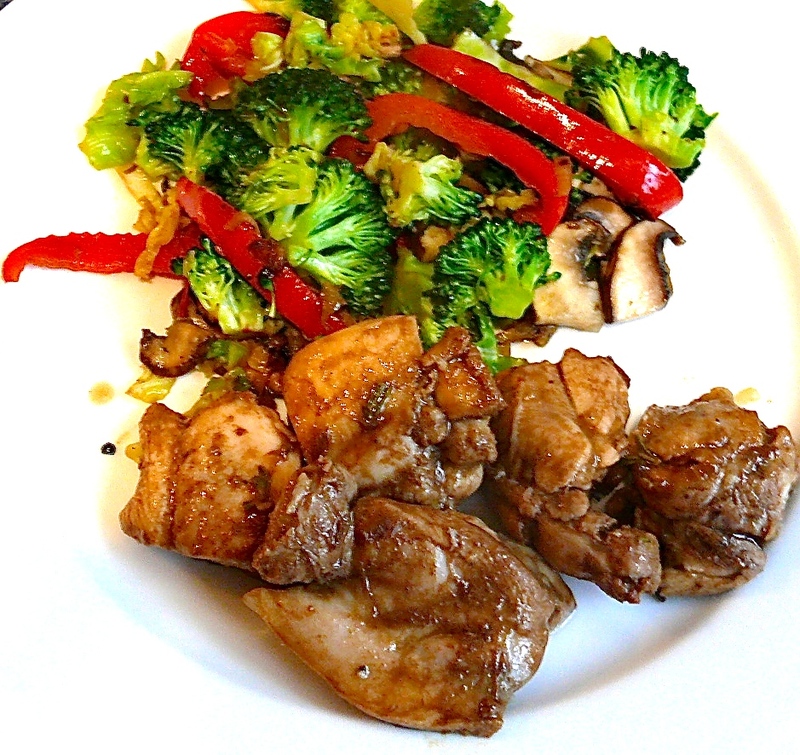 • Carry on the stir fry by adding cabbage and mushrooms. • Turn the heat up a little at this stage and mix in the coconut aminos and reserved marinade. • Stir through well and cook for a minute or two. • Taste and adjust seasonings.